UPDATE May 1st, 2007 (forgot the two final steps 8 and 9). I’ve run into the situation a couple of times where I get started on a client’s office, but due to delays and politics it takes time to get a proper versioning control server set up. It turned out to be easy when I figured out the where to find the details on it. I’m running windows XP, don’t know how this differs on other operating systems. 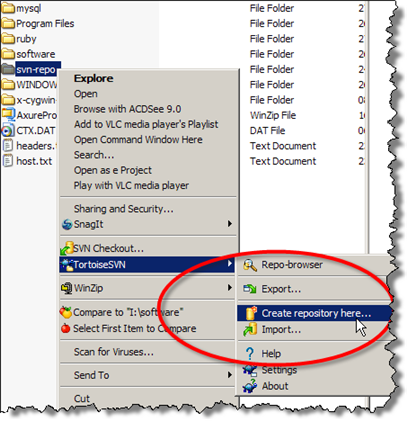 In windows explorer find the root folder for where you want your repository (this should be different than where your code workspace is). Now it’s time to check out the files from subversion. Right click and choose “Check out…” in the context menu. 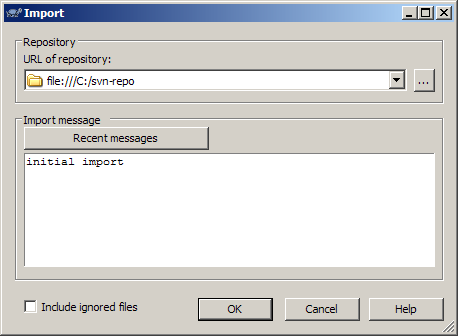 Then select your repository, in my case “file:///C:/svn-repo/projectname“. And you’re done! From now on, your code is versioned, and can later be ported to the real subversion repository (any comments on how this is done would be greatly appreciated). Now, you can commit changes, view and diff changes, merge and roll back. Just like you would do in a normal code repository. For user and access control it’s possible to modify the config files in the subversion /conf directory. The files in /svn-repo/conf/ has the info (although it’s not very self-explanatory). The repository is only set up for file access, so you will need to share your repository in order for more developers to use it. All in all, this can be a great benefit and speed things up in enterprise environments, where many chefs are involved in the most basic tasks. Please feel free to add your own advice and tips in the comments. This entry was posted by Jesper Rønn-Jensen	on Thursday, April 26th, 2007 at 21:30 (GMT-1)	and is filed under Code, Productivity, Prototyping, Web Development. You can follow any responses to this entry through the RSS 2.0 feed. Both comments and pings are currently closed. I’d suggest setting up some hosting somewhere and having your repository in a remote location (you can do this over the discussed http protocol), then you don’t have to worry about a volatile repository on your local machine (laptop?) or merging into the main one later. Russel. Thanks for your suggestion. I actually already have access to a subversion server hosted at a remote location. The only thing is, that I often run into “enterprisey” rules about not putting business sensitive data on a foreign server outside corporate firewalls.